All the content you create in TailoredMail is immediately sharable with the industry's most popular networks and search engines - and is fully tracked. Emails, landing pages, videos, images, surveys and links can be pushed to multiple Twitter, LinkedIn, Facebook-Fan-Pages, and search engines. Plus we have our own URL shortener—goread.me—and an all-in-one report of the interactions with your content. In addition, we offer all of the standard social sharing options, including support for over fifteen social networks - the most obvious being Twitter’s “Tweet”, Facebook's “Like”, Google's “+1”, and LinkedIn's “Share”, as well as email forward to a friend (F2F). 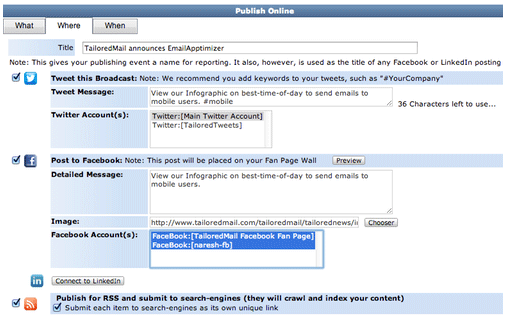 The key difference with TailoredMail is that each individual content-item (or news article) can be individually shared. With all other email platforms you can only share an entire newsletter, for example. The benefit here is that subscribers get to share ONLY the very specific content they want to share, and you get to track it all. TailoredMail offers a highly unique Facebook Fan Page App that installs directly into your own Fan Page. 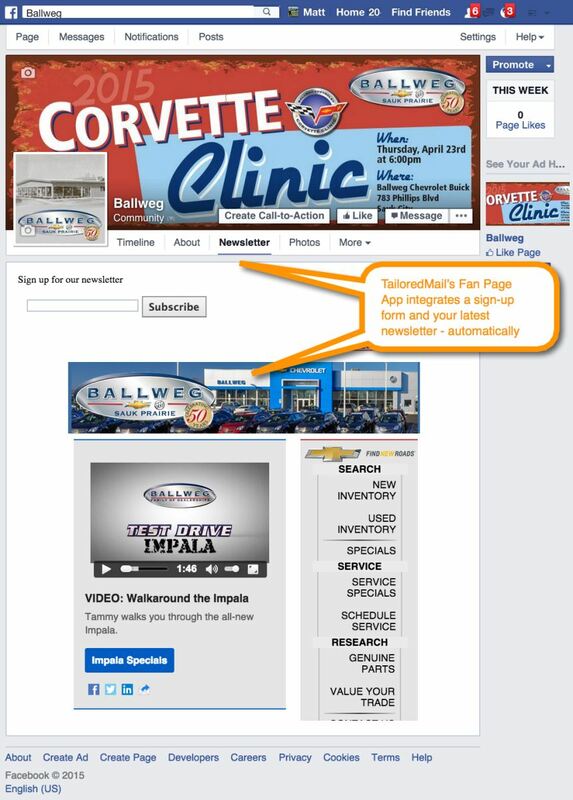 It can capture new sign-ups, and it can automatically show the latest newsletter you create, automatically. Our survey widgets, videos, and anything else you create within TailoredMail can be included in this page/tab. Plus, you get full tracking of any views and clicks from whatever is shown.